March 14 (Saturday, 1-4 p.m.) Docent Training for Freedom's Friends History Walk. 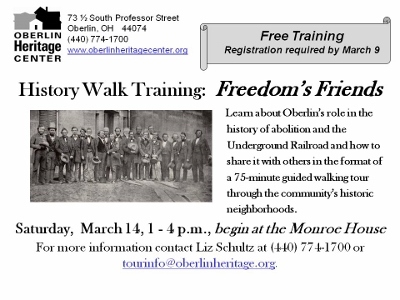 Learn about Oberlin's role in the history of abolition and the Underground Railroad and how to present it in the format of a 75-minute walking tour. Docents are asked to lead at least four tours or history walks per year. Training is free; registration requested via e-mail to Liz Schultz (tourinfo@oberlinheritage.org) by March 9. Location: Meet at the Monroe House.